A snake found near Kukke Subrahmanya with 5 heads…. Kukke subramanya can be reached by road from Mangalore and Bangalore. KSRTC buses are operating buses daily from these two places. Nearest airport is Mangalore International Airport (Bajpe Airport ) at distance of 115 km.The nearest railway station is Subramanya Road railway station on Mangaluru-Bangaluru railway route, which at 7 km from Kukke Subramanya. The Kukke Subramanya in Karnataka is at a distance of 386 kilometers from Bangalore and 151 kilometers from Karwar. Kukke Subramanya lies on the bank of river Dhara. As goes the Hindu mythology, Lord Kumaraswamy arrived to this place after destroying the demon rulers Taraka, Shoorapadmasura and many others in a battle. It is said that the Lord washed his Shakti Ayudha (the battle-axe in the form of a bayonet) in this holy river. The the river in the Kukke Subramanya is popularly known as the Kumaradhara. When the war with the demons was over, Lord Kumaraswamy went to the top of Kumara Parvatha together with his brothers Lord Ganesha, Veerabahu and others. They were greeted by Lord Indra as well as the other Gods. Lord Indra was so moved by his bravery that he prayed the Lord to marry his daughter Devasena. The marriage took place on the banks of Kumaradhara on ‘Margashira Shudda Shashti’ with much grandeur and celebrations. Lord Kumaraswamy gave visit to Vasuki the chief of the nagas or the snakes, who had been undergoing a penance in the Kukke Subramanya. Vasuki prayed to the Lord to remain with him forever at this place. The Lord accepted and granted this boon. Till then it is said that the Lord has remained in his spiritual presence in this shrine along with his wife Devasena and Vasuki. Each year a popular car festival is held in the Kukke Subramanya of Karnataka on ‘Margashira Shuddha Shashti’ with special offerings to the Lord. A/C, Non A/C rooms, TV, Hot water, Parking, 24 hour power supply, STD/ISD banquet hall. A/C, Non A/C rooms, TV, Hot water Parking, 24 hour power supply STD/ISD. 5. Shreenikethana Lodge, Managed by Sri Subrahmanya Mutt, Car street, Subrahmanya. Note to Readers: This article published for public information about the recent E-mail forwarding related to 5 headed snake. We can’t understand that photos created by using software or is it original… Public can comment. Kukke Subrahmanya is one of the most famous temple in Karnataka, India. This is a fake Picture. Please dont try to make others fool. What a fantastic snake ? 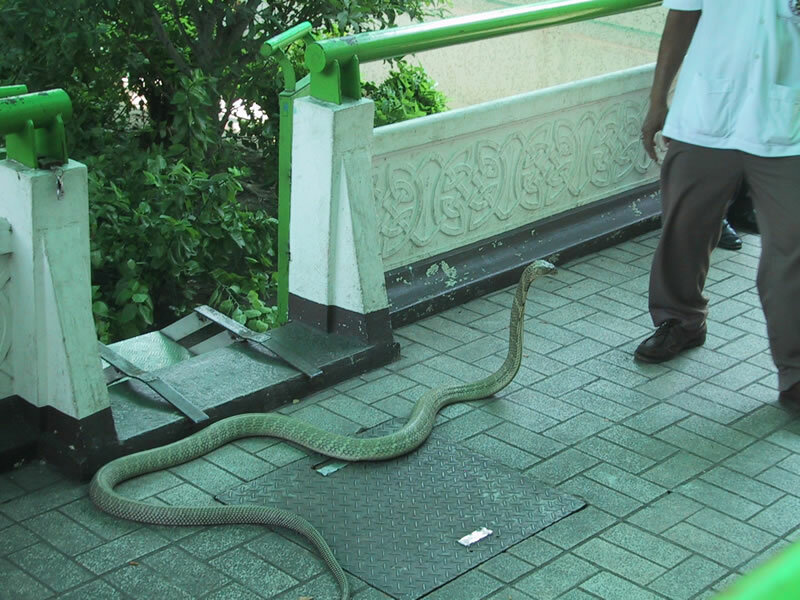 i think its king cobra …. excuse me do u know what a value of a good hindu? Obviously not please do not say things like that!! Its unbelievable………….Any other photos ? Definitely these two are different snake. Someone has used photo shop. @sarvesh……the five headed snake was false……it clearly declared by kukke temple authorities……u can check in kukke website…. sarvesh, i cant join with your comment. Because that snake photos taken at different places. so may be lights affected while taking the photo. I think both places are near to the famouse temple named Kukke Subrahmanya. i think in history of international geogrophic science we are not heard about such snake. Your Right Bro…. this photo is fake. Its the photo shot from the park near “Biladwar” The first is the photo work..
WHAT DID U SAY???? you know photo shop huh? Brother your trapped in a dark world get OUT SEE FOR YOURSELF. DEVRA HESRALLI JANAGALIGE MOSA MADBEDI DEVRU MELE IRUVA NAMBIKE ALAGBIDUTHE. i think its not a real snake . don’t spoil the temple name………………..
Great dost! some one done good work by photoshop, and yes want to say dont spoil Indian temples values by this rubise. This is true this temple is in karnataka not in tamil nadu i have visited this place and its very nice place to visit too…. such snakes in the world are founded earlier like this its a photographic effects . bcoz the two snakes are not similar,not at one place,and also not look like………….with any were in these world. the two snakes are different in vision i think its a graphical work. More than the photos.. I enjoyed their comments…. If it is really found in that place, why they have not captured and kept in a safe place, why they took only photo, it is untrue. Donot believe this. It is really worked with a good photographers hand.Donot believe this believe only god. This is graphical picture.if not give proof. krishna kalappat – vani i agreee with u ………..
I’ve seen 3 headed snak live in Houston, USA… so i can believe this…..
i ‘ve only heard abt 10 headed snake in kukke subramanya, so i cant compleately doubt dis pic, if dis s really viewed by anyone den i request d concerned person to giv d clear details of dis, if nt pls do nt play lyk dis as i(we) beleiv kukke-subramanya s very pwrful place fr all naga doshas. cs4 work..if this true than it would rock the world..
@sumit…i agree with u…the second photo seems to be like a statue….gud find.. I am living in Subramanya.. I didnt heard abt this type of Snake. He we saw lot of Snakes such as king Cobra, etc… Glassy coloured snake, the snake which is climmbing the tree in a single stretch.. a lot more is here.. But this type of snake is not here..Dont beleive this !!! I have seen two headed snake…one in the front and one at the back…. I heard Chitra saying there is a traing from Mangalore…Do we have train from Bangalore…. We can plan and go togther to reach on this snake..
Will the thinking of all the heads is the same? If one heads thinks to bite me, will the other say no? If one head has head ach… will the other have same? Snake will be confused for sure…. If this snake is true..then why Discovery, NGC or Animal planet does not talk about it. May be they dont have train from there to Kukkesubramaniyan…. I belive in God and i have seen many picturs like this, but not seen any time this kind of real snakes. In the pictures 1 st picture looks like real in the water. But 2nd it seems not the same picture. Any way, the person who took this photo (if it is real live snake) should contact immediately ANIMAL PLANNET and Discovery channels to tell the world INDIA is land of Gods. Otherwise, people lose faith in Hinduism. Pls protect hinduism greatness. Hey come go and infrom the channels if you are sure……………. This is a single head snake in bangkok. They breed 6 kinds of deadly snakes there to provide antivenin, supplying most of Southeast Asia. View the below site for more details. I’m from South Africa. We have strong belief in our religion and the knowledge of the 7 headed snake. This work of con artists are gonna tarnish our religion and others will laugh. I am beliving nature not god. But natur spolied by Human beign. bakvas hai ! ye log kal chal k 5 head ka aadmi dikha aisa bhi bol sakte hai ! aur photo doubtful hai. baap re ! i m also afraid. 9th wonder of the world. really amazing… if any of the gays get like this.. ffd it to #@#$## @ gmail. com.. hhmmmm and sm body commented that its edit and sm thing.. its… lie…..
may be this special effect of photography. if this is true.all media channal must be telicast about this. Who is going to believe this..this type of things can happen only in India……. captured image too close, it’s illogical that someone brave enough to snap such animal’s pic just at 1st sight. d snake seems to attack something coz it opening its mouth bt whr is d tongue?? Is d snake just yawn? N, if just a normal snake standing in that state, sure v at 10 mile away redi. Tis is 5 headed snake n yet d photographer… gotta salute den.. hehe..
N most important, afta reading those comments, if sum1 really able to catch a real pic of 5 headed snake, most of them will not accept d truth..
N personally, i’m interested in d tis 5 headed snake n i just dono d reason..
that is king of cobra ! ye to bhagvanka karishma he ! only heard about it on shri krishna,but i guess its the truth,because i myself had seen two headed snake in reality.its truth and we shouldn’t question on our puran and should believe. The first photo seems natural and it also came out in one of the Marathi dailies in Mumbai yesterday.That matches exactly with the first photo here.Multi headed creatures are generally regarded as deformations in medical science but usually they do not survive for long. I am not associating this snake with any mythology or religious belief. Best way to confirm is to take a video ( if the snake is still there) and publish it.I am extremely fond of snakes and if the snake exists really , request people not to scare it or harm it. I never beleive this beacuse the five headed snake is in my custody for last two years. So how did you find in kukke? 2. the colours at the neck are blue and yellow in both pics…i.e. different. why it only happens in india? My native is kukke subrahmanya.. As per my knowledge such snakes didnot found in kukke or surroundings..
i wish for them who never believe in nature’s wonder this may be possible if indian mythology says that there was an snake having 5 heads called sheshnaag. i am good believer of god and also mythological characters like ASHWATTHAMA. I have seen in animal planet where they show rare findings of 2 headed snakes. When I was young I had read in a article with picture about 2 headed snake. My mom had told me that when she was very young she had seen a 5 headed snake while she was walking to agriculture field. Temple is already famous. I don’t think anyone needs to make it more famous by photoshop work. Just like due to genetic impairments 2 headed people get born, multiheaded snakes can also be born. If a snake like this exists, what it has to do with god or temple. I am not sure is this snake is true or not. If at all it exists, there is no surprise about it. It just happens to be in kukke subhramanya area. In animal planet they show such multiheaded snakes are found in other parts of world also. It’s a wonder five head snake, but i am confuse is it a real ? If this snake is real or not ? But peopele will belive Kukke subramanya temple is very powerful. and i have 1 question, if the 5 headed snake is real n can b found means wat gonna we do to it?? Hi guys, People are using money for the click used. Please install this software called ‘JEPGSnoop'(http://www.impulseadventure.com/photo/jpeg-snoop.html). Install it and upload any image and check whether the image is edited or taken from a camera. The package will give you a assessment report, check it out by yourself. i cant join with your comment. Because that snake photos taken at different places. so may be lights affected while taking the photo. I think both places are near to the famouse temple named Kukke Subrahmanya. It’s really funny. Only superstitious people would believe. It happens only in India. Crazy people. Shame to the person who created this fake image. this is real one so plz dont make any fun of it. if u dont belive on it dont do we r forcing u to do this but atleast dont hurt the devotees. Sadly its FAKE. 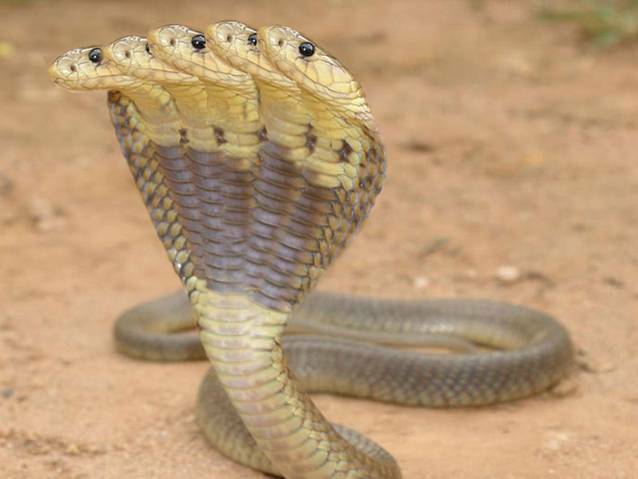 IF its true, there will be video’s capture of the 5 headed cobra. No videos, and only 2-3 pics of it??!!! Use some sense, I’ll capture tons of it and even video it. Plus, National Geography WILL definitely FLY there and brings CORWIN there!! going further deep into science….cell fission is possible in case of mammals…but snake is a reptile…it would have been true in case of boa!…but for cobra…nope! he can create anything and destroy anything in seconds. This is true no photoshop idiots can do this.. I had mailed this picture to Austin Stevens . He confirms that it is fake . One is a rubber snake and the other is not found in India . It is found only in Africa . Austin Stevens is renowned herpetologist and his documentaries can be seen on animal planet and discovery . There are stone images of this type of snakes, made ages ago in India. They can be seen commonly in all temples. What made them think of this? I don’t think they were mischief-minded people. i am confuse is that real or just fake ? bt after some time i am dam sure its a great work on photoshop. but thanks for entertainment . I think it real snake and no comments regarding that. ya its no a real snake.it’s a graphic done in photo sope……. this is a artificial picture created in photoshop. i also know its a photoshop work. i have been working in photoshop from last 4 yrs. i m sure abut this. snake with 5 heads !!! Is there a video evidence ? its fake…..can prove it.. but good photoshop work… hats off..
You will come to know whether the snake is fake or not..I can give you a hint.. These photos are fake. These snaps are clicked in Bangkok. And the snakes are single headed..
And my advice to all people out there.. Please use a powerful tool called “Google”. You can do ur own research before coming to a conclusion. Be quiet believe in god. god is a god, humans are human. But five head snake exist, even seven, as we must just accept it.u say why? bcoz ancestors say many things as a crow makes it’s sound caw-caw then some one is coming to our house. Like this all like many things are said and they will be able to say after one has dedicated their lives(ancestor’s) behind this. But we have to just accept it and question not as why? as you will get the answer of this if u very keenly observe and feel it later or many days it takes. just have patience. our ancestors are our way to guide our future ways. Dont ignore our culture as our culture is the richest culture of all in all fields of science. just explore this from all of them, even though he may be ur hardest enemy. The original photo (?) of this ten headed cobra is released. Do you want compare? N0nsence its true. . .diz snake blvin by tamil ppls m0stly nagorkovil district. .search in google map “ambalapathi”. .disz amazin sea no body take bath here. .c0z diz sea waves came like snake head. .black 23 head snake living in diz sea. .its true and that snake god. .search in google “ayya vaikundar avatharam”. .u know about this snake and god. .some guys said its fake. .ok ok. .why all are believing god. .have u ever seen god b4. .but whole world blvin god. .if god iz true 5 head snake also true. .read pagavath geethai stories!. .. .5headsnake in back side of god narayanaswamy’s. .dunt coment like bldy mother #@#@ers with out known about dis. . .
Utter RUBBISH… the people who post such stupid things on the net has to be punished first.. Because of such fools people are confused on which are the real n which is fake ..
if this was true…lol there would be hundreds of images of this snake and it would go on tv as a new finding, but its a very poor photoshoped image, hence why the person who made this only had chance to create 2 images, think about it if you had a camera and were there you wouldnt only take 2 pictures would you. 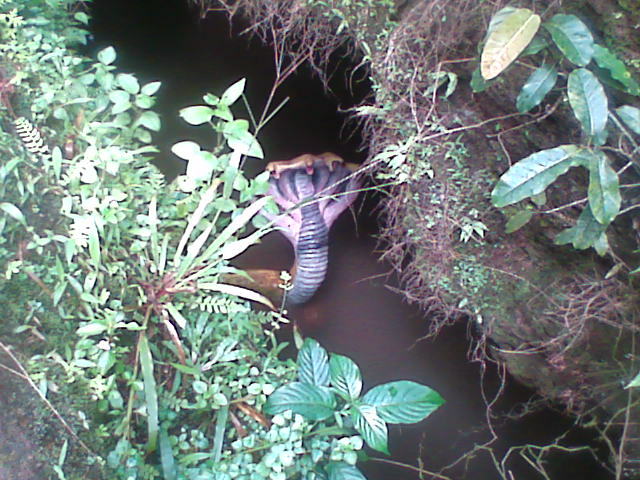 This is not the snake that seen in Kukke Subrahmanya Temple…lol.. I think this is a fake photograph if it is true we’ll get it in video photos. actually what human tendency is they dnt believe till they witness any incident. but speaking honestly about the fact the 5 headed snake do exists. because when i and my friend visited kukkeshree temple the snake stood behind my friend and i took few snaps of that snake….. so all who commented regarding this matter may have got ans by this and its up 2 u all 2 believe it r not…..! Your the only one here who understands the value of a great hindu. Hats of to you!